The bummer about cooking is that we don’t always have time to do it. It seems like there’s always something that gets in the way of our grand dinner plans. As they say, the best laid plans…inevitably devolve into a hysterical baby on the floor, permanent marker streaks on the walls and stains on my shirt. That’s why I love one-pot wonders— especially when half of the things you have to do simply involve dumping in a bunch of ingredients into a pot. 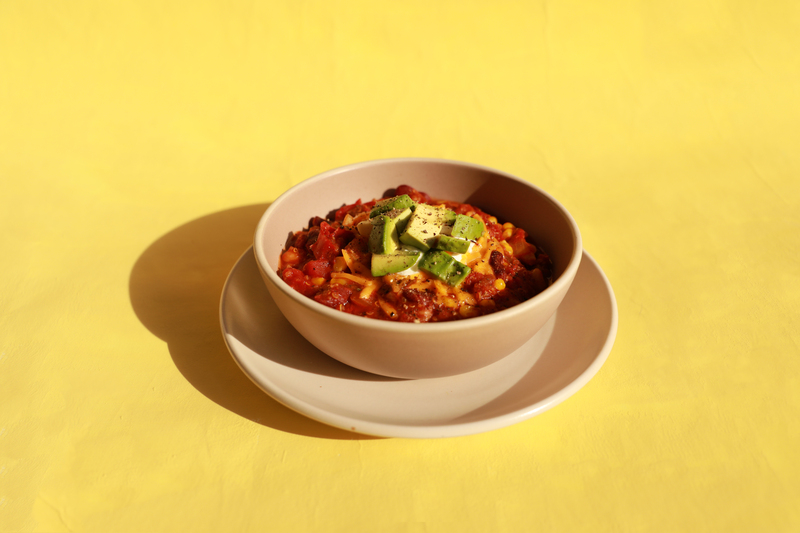 Our Vegetable & Quinoa Chili, inspired by our chili puree, is packed with nutrients, so you can feel good about giving it to your whole family. There’s plenty of ways to dress this dish with toppings, including avocado, sour cream and shredded cheese. If you’re looking to add meat, you can also sautée some ground turkey or beef and combine. It’s delicious, hearty, and perfect for making an extra large batch so that you have extra for lunches. Your new favorite one-pot wonder. Nutrient-dense vegetables, fluffy quinoa, warming spices. In a large stock pot, combine diced onion, minced garlic and olive oil. Sauté the onion and garlic until the onions are soft and translucent. Add in quinoa, diced tomatoes, tomato sauce, green chiles, kidney beans and white beans. Mix until well-combined, and allow to simmer for 5 minutes. Add in frozen corn, smoked paprika, cumin, dried parsley, chili powder, turmeric, salt and black pepper. Mix until well-combined. Allow the mixture to simmer for 20-30 minutes, until the flavors are well-combined. Serve the chili into bowls, and top it off with a dollop of sour cream, a sprinkle of cheddar cheese and chopped cilantro, diced avocado, and a sprinkle of fresh cracked black pepper.